Wildlife professionals such as biologists and zoologists often do research on birds in the wild habitat. Field research gives the world a better understanding of every aspect of the natural history of wild animals. 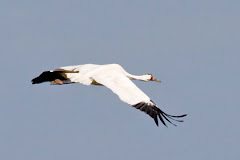 Those things include food habits, migration, breeding behavior just to name a few. Without this kind of research we would know little about the natural world. During the course of the study of various species, handling is required. 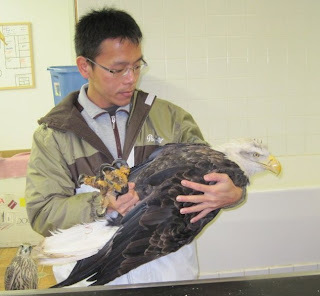 Getting training for handling large birds is difficult to come by. That is why many students and wildlife professionals from undergraduates to those that already have their PhD and veterinarians turn to REGI for training. REGI is honored to have provided training for hundreds of wildife professionals in the past few years. It is just one way in which we help the future of wildlife. Karla Kinstler, Houston MN. and Director/Naturalist of the Houston Nature Center, has been a year Bush Fellowship this past year. 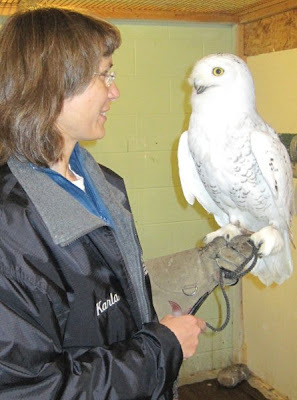 She has traveled all over the U.S. and Europe viewing and participating in various programs specific to owls. 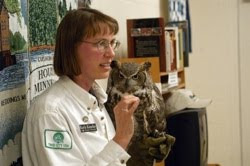 Those facilities includes wildlife centers, owl research programs and environmental education programs. 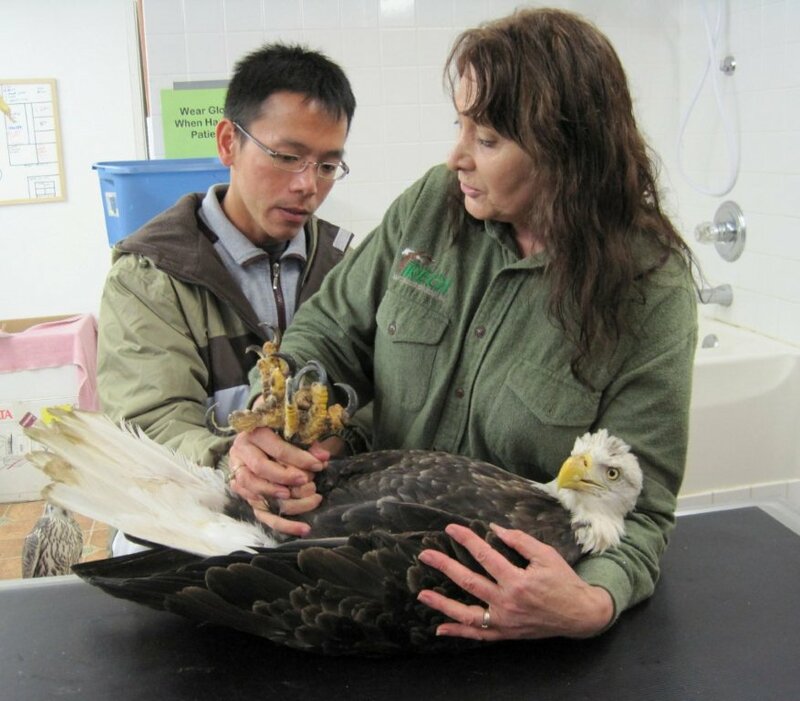 Karla's fellowship allowed her to gather information on all aspects of husbandry for wildlife in captivity. We were honored that she chose to spend a few days with us at REGI this week. Karla is no newcomer to wildlife education. It was under her guidance the International Festival of Owls was born and has grown to a wonderful celebration of owls and nature in early March in Houston, MN. Amazingly, Alice the Owl began life in Antigo on Hogan Street. She fell from the nest early in her life. 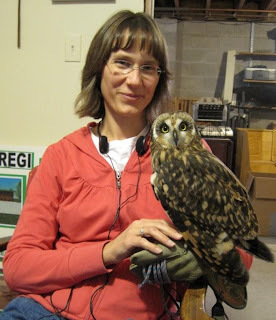 My late mother and I rescued the tiny owlet that would become the huge Great-horned Owl named Alice. That incident occurred over twelve years ago. The young owlet had serious damage to one wing and we knew early on that she would never be able to fly well enough to be released to the wild. We opted to raise the owlet as an education bird. When she was grown we looked for a very special placement. Karla fit the bill for the wonderful placement we were looking for. The rest, as they say, is history. Karla and I mused this week about how much good can be accomplished through a single encounter with a special education bird like Alice. The truth is we never know when a person in the audience changes their course in life because of this chance encounter. It was great to spend time with both Karla and Alice during their trip to REGI. We will be seeing them again in March during the International Festival of Owls in Houston, MN.